Our 420R is the newest addition to the fleet. 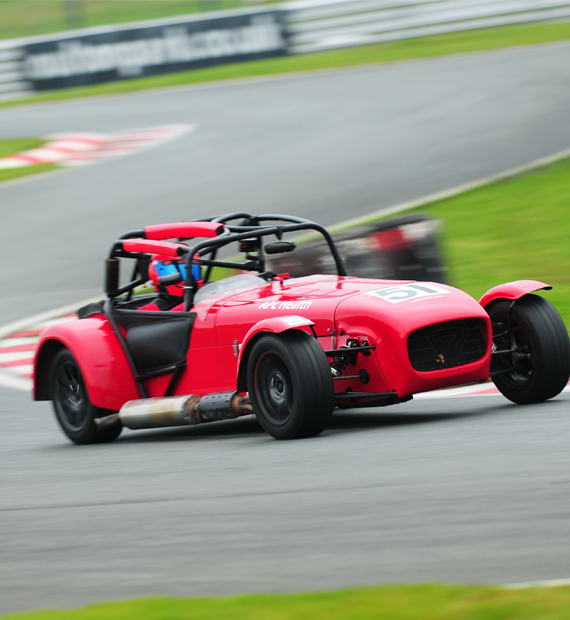 It uses a 2.0-litre Ford-derived engine that has been previously used in other Caterhams and is also shared with the 360 model, but in R form it gains dry-sump lubrication which increases power and makes it even tastier on the track. With 210bhp, the 420 deals with 60mph in 4.0 seconds and has a top speed of 136mph. Power is fed to the rear wheels via a five-speed manual gearbox that has the shortest of throws with precision that’s slicker than an oil spillage. Weighing in at 560kg, it manages 375bhp/ton – just a few points shy of the Ferrari 458 Italia. 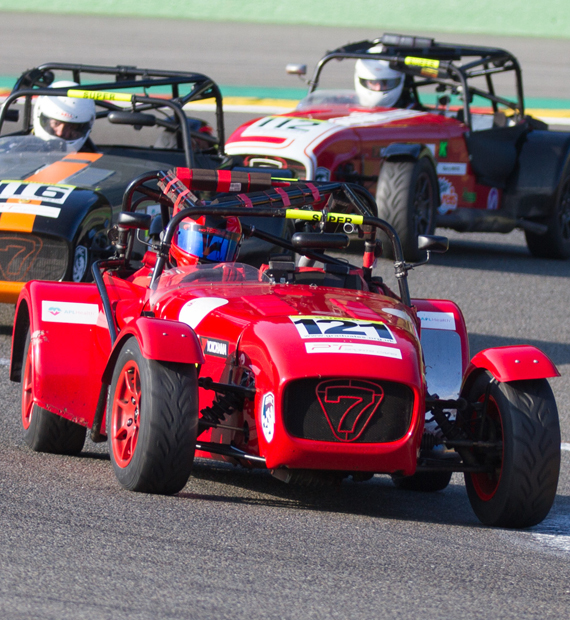 Our sigmax is a 2014 Caterham Supersport, which has been raced in the Caterham Academy, the Super 7 Inter series, and now the Caterham Graduates. It has the Ford Sigma 1.6 engine from a Focus, with the wide track front suspension and limited slip differential at the back. The dry weight of the car is around 510kg, and it produces 132 BHP. There are also a few extra toys, such as an in car brake bias adjuster and an inbuilt data analysis kit. The power difference and LSD make this around 2.5% faster on a circuit than the Super, which equates to a difference of about three seconds round a lap of Oulton Park or Snetterton. This is a 2002 Caterham Roadsport. It has the beautifully built and fantastic sounding Rover K-Series engine with a 1.6l displacement, and produces around 120 BHP. With the demise of Rover, the Caterham K-series combination is becoming increasingly rare, and this car with its racing pedigree is fast becoming something of a collector’s item. This car has raced in the Caterham Academy and the Caterham Graduates for several years now, and is still as immaculately reliable as ever. It brings driving pleasure and race craft back to the absolute basics. In effect, it’s an engine, a gearbox, a chassis and four wheels. Anything else would be superfluous! 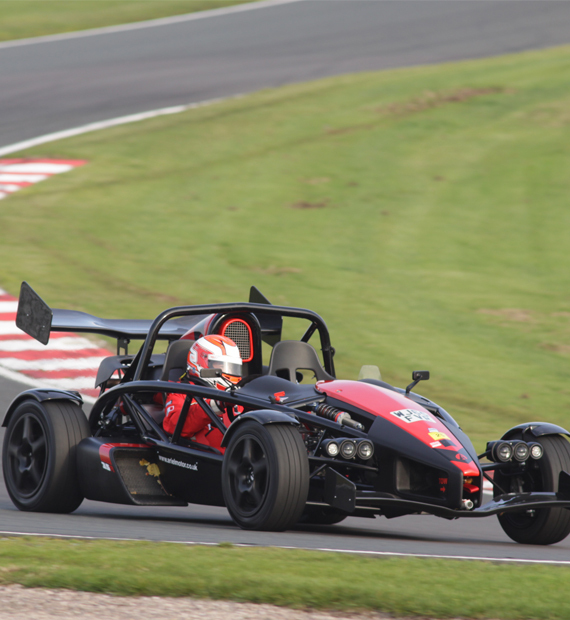 Originally launched in the 1990s, the Ariel Atom is now an established motoring icon, turning heads both for its looks and the fact it is as exhilarating a car as you could wish to drive. At Torque Motorsport, we have the new supercharged Atom. Its 2.0-litre supercharged Honda engine now makes 350bhp, up 10bhp on the Atom 3. In a spindle of pipework weighing just over 500kg, that means a power-to-weight ratio of around 600bhp per tonne and a 0-60mph time of about 2.5 seconds. We use our Atom purely for the thrill of driving, it is truly exhilarating. When you first enter it shocks you into muted fear, but after time draws you in and traps you. The scream of the supercharger is frightening. We believe everyone should experience this car. Our purpose built race wagon has just about everything, combined into a (relatively) small area. 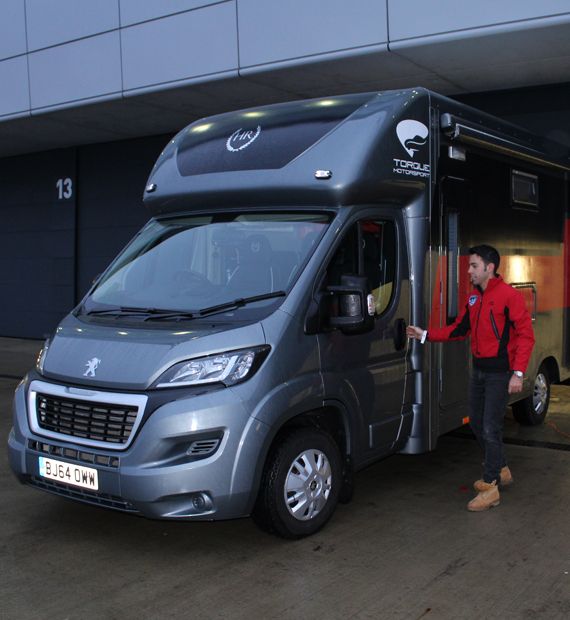 Living and working accommodation at the front, and an area for the car, awning and tools at the back. The amount that fits into a small space in this truck would leave even the Ikea designers scratching their heads. So far our wagon has seen some pretty impressive sights, including Silverstone, Donington, Spa-Francorchamps, Oulton Park, Snetterton, Brands Hatch and Rockingham to name a few. Although it’s not always the most glamourous place to sleep, the truck is also often the venue for a barbeque and a few beers throughout the course of a race weekend! Whether we’re supporting our race team in a series, or transporting cars and offering trackside support to our customers, Wendy is a fundamental part of the Torque Motorsport team.